Property facilities: 24 hour reception (high season), airport transfers, breakfast included (high season), cable TV, common room, free city maps, kitchen, linen included, lockers, reading light, safe deposit box, travel desk, towels included, 24 hour security, air conditioning, cafe, free internet access, free WiFi, hairdryers, hot showers, house keeping, internet access, tea&coffee making facilities. In the heart of Rijeka, our hostel is located only 20 metres away from the townâ€™s main pedestrian zone the Korzo. It is only couple of minutes walk from big shopping centers, shops and restaurants with local food. There are also lots of attractions close by like: St.Vitus Cathedral, the city tower and city gate, the croatian national theatre 'Ivan Zajc', the Korzo 'fountain', 'Trsat' castle and many moreHostel 1W is 300m from the bus station and only 10 min walking from the rail way station. The closest Airport is ubicate only half an hour away in the island of Krk. Taxes not included - tourist tax 7.00 HRK (1 Euro) per person per night. 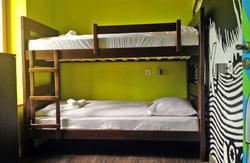 The hostel is located in an old building, therefore it is not accessible for disabled guests. Hostel 1W is in the very heart of Rijeka, 20 m from main pedestrian zone, 300m from the bus station and only 10 min walking from the rail way station. The closest Airport is ubicate only half an hour away in the island of Krk.